Some people, like Kate, elect to celebrate the Fourth of July by grilling out. It’s a great way to get together with friends, and often the burgers you grill are mighty tasty. But that’s certainly not the only way to do it. And if you find yourself with a free day in California, and you’re not spending it at the beach, you’re doing it wrong. So I celebrated America by spending the day in Redondo Beach, with a burger in my hand and a bald eagle on my shoulder. 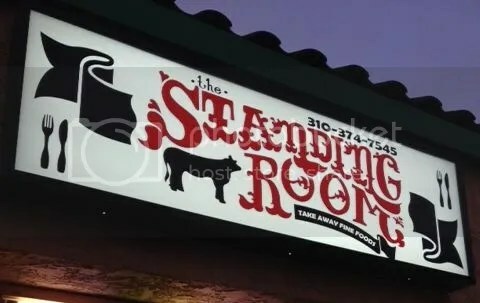 I got my burger from The Standing Room, a Redondo legend located in a liquor store. Let me say that again, this is a burger joint inside a liquor store. If they had showers, I’d never leave. Among the many options at Standing Room, I went with the Napoleon. But where Napoleon the man was small in stature, Napoleon the burger was anything but. This burger was huge, and even more so, it was ridiculous. The veritable Sharknado of burgers. 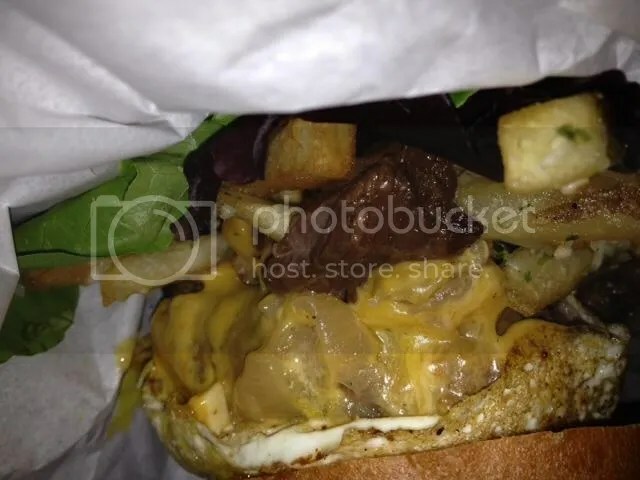 The Napoleon features a half pound patty topped with – get this – bacon, smoked gouda, cheddar, caramelized onions, spring mix, braised short rib, fried egg, and truffle parmesan fries. So let’s break it down. The Good: Braised Short Rib. Think of topping a burger with slow-cooked, pot-roast-like meat. 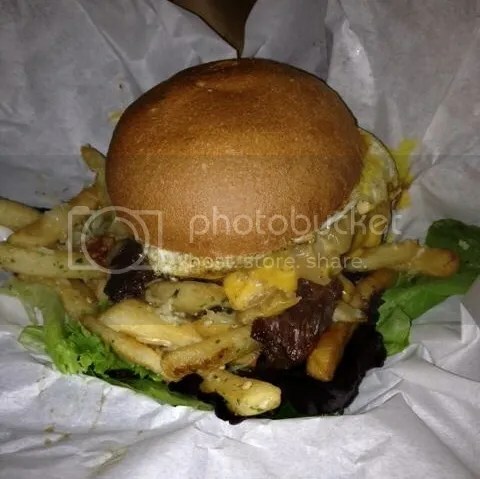 It added to the meatiness of a purposefully over-the-top burger, but still managed to bring different flavors and textures than the ones found in the actual patty. The patty itself wasn’t bad either. The Not-So-Good: Fries on a burger is good in theory, and often great in execution. And these fries wouldn’t have been so bad, if they weren’t drenched in truffle oil and Parmesan cheese. Usually, I love both truffle and Parmesan, but they completely overpowered every other element of the burger. Spring mix, it seems, is code for fancy lettuce. But rather than adding a clean crisp to the burger, the spring mix had more of a yard work effect, in texture and in taste. Not ideal. Another issue, albeit one based on personal preference, the fried eggs were way too runny for my taste. And The Standing Room’s worst crime? They forgot the bacon. Because of the large amount of toppings, and their uneven nature, the Napoleon was difficult to eat. It fell apart immediately, making it easy to pick around the ghastly spring mix. I ended up eating the burger with a fork and knife. The bun was a casualty of this fork and knife method – unfortunately, the bun wasn’t much good to begin with. All in all, the Sharknado comparisons to this burger are not unfounded. When you go for bombastic, you’ve got to hit a home run. In The Standing Room’s case, I hoped for a Cabin in the Woods, but got stuck with a Tara Reid lead. It overcompensated for its lack of cohesiveness with baseless bravado. Maybe this giant burger had a Napoleon Complex all along. As always, leave us comments! Tell me where I should eat! Tell me why I’m wrong! Just kidding, I’m never wrong.